In the cervical spine, or neck, consists of seven distinct bones, known as the cervical vertebrae. Under normal circumstances, the cervical spine has a curve with the apex towards the front of the body, known as lordotic curvature or lordosis. However, poor posture while standing or sitting down and increasingly when using technology, such as computers, phones and tablets may cause an abnormal condition called postural kyphosis. The reversal of the cervical curve is not, as suggested by historical, largely discredited scientific research, a “normal variant” of human posture. It is, in fact, an abnormal condition that both reverses and significantly increases the forces experienced by the cervical vertebrae. The cervical vertebrae are amongst the smaller of the bones in the spinal column. In a normal, lordotic cervical spine, they experience only minimal forces, front and back. However, according to an article in Clinical Biometrics, in an abnormal, kyphotic cervical spine, they experience forces up to 6 to 10 times greater. Consequently, kyphosis can lead to degeneration of the bones and discs in the cervical spine, as well as the surrounding muscles and ligaments. Indeed, the condition may accentuate compression of the spinal cord hindering communication between the brain and the spinal cord and hence the limbs, nerves and skin, making it more difficult for the sufferer to respond to his or her environment. In addition, forward head loading occurs with these kyphotic necks. The head juts forward and will subsequently put an additional load into the posterior muscles of the neck when sitting, standing or walking. In addition, the typical “rounded shoulders” and poor posture will apply in such cases. 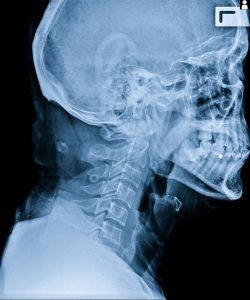 Chiropractic care for the treatment of cervical kyphosis is a relatively recent development but, while what happens following cervical corrective care is entirely under the control of the body, it is clearly a valuable, nonsurgical treatment option. Thankfully, the early attempts to correct curvature problems using traction devices – which were, frankly, ineffective and, often, downright dangerous – are only a memory, consigned to yesteryear. Modern chiropractors typically use spinal mobilisations or adjustments, also known as manual therapy, as their primary tool for treating pain, stiffness and other symptoms of kyphosis. Dr Adam Rocchi, a South Perth chiropractor uses the Spine Scan adjusting instrument which works by applying force to the small muscles over the joints of the cervical spine to restore the structural integrity of the region and initiate natural healing processes. He may also recommend a course of rehabilitative exercise which, alongside manual therapy, is an effective treatment for improving range of movement in the neck. When it comes to your choice of chiropractor, Applecross is only a few minutes’ drive away from the neighbouring suburb of Mount Pleasant and also easily accessible from the other suburbs in the City of Melville area. Call the practice now on (08) 61508785 Scarborough or (08) 61508783 Mount Pleasant to arrange an appointment. Rotator Cuff Injuries in Cricket – How can a Chiropractor Help? Let us help you get relief from your symptoms. Call (08) 6150 8785 now.